Only 48 hours in Thailand? Here are 13 experiences you shouldn’t miss! Bustling Bangkok City could be on everyone’s wish list. The particular draw of this lively city is its array of activities and mix of modern and traditional culture. There’s something here for every palate, wallet or timetable! 1. Lumpini Park – A green oasis at the center of the Bangkok central business district. It boasts a beautiful man-made pond bordered by 25 km of pathways, making a great place for socializing and working out. 2. The Bangkok Transit System (BTS) – Also known as the Skytrain, the BTS is an elevated rapid transit system in Bangkok, Thailand. 3. Traditional Thai Massage – A traditional Thai massage is not for the faint of heart. “Thai massage” or “Thai yoga massage” is an ancient healing system incorporating acupressure, Indian Ayurvedic principles, and assisted yoga postures. 4. Siam Paragon – A mega mall for shopping and the amazing 4DX/First Class Cinema experience! 5. Patpong Night Bazaar – Patpong night market includes a random assortment of stalls selling knock-off goods and souvenir shops that are flanked by go-go bars and clubs. 6. Songthaew – The name “songthaew” literally translates to ‘two benches’. These vehicles are trucks with 2 benches in the back. They not only transport precious human cargo, but also often make stops off-route to deliver fresh produce to markets and restaurants. 7. Grand Palace/Wat Phra Kaew – Is one the most revered of all attractions in Bangkok. 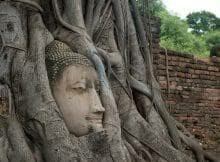 Many of the temples on the compound were constructed long before Bangkok was even the capital city. This was the home of the Kings of Siam for over a century. 8. 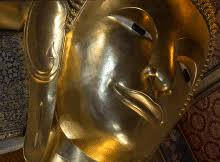 Wat Pho – The home of the golden Reclining Buddha. 9. Long-tail Boat – Another popular form of transportation in Bangkok is the long-tail boat. The “tail” is a common automotive engine used as a readily available and maintainable power source. 10. Tuk Tuk – Enjoy a ride on this 3-wheeled vehicle as it whizzes through traffic and into spaces a car just won’t reach. 11. The Golden Mount – The highest point in Bangkok City, it takes 344 steps to get to the summit for breathtaking views. The best time to visit is at sunset. 12. Wat Saket – The temple atop Bangkok’s Golden Mountain Temple. 13. Khao San Road – There are lots of things to do in this area, from trying various Thai meals and desserts, to getting a suit fully tailored, to shopping for souvenirs, taking a party bus, getting a massage, or going to karaoke. If you’re pressed for time, this place is THE microcosm of Bangkok City. Have you done any of these things in Bangkok? Are you currently planning to visit? Let me know in the comments below! Keeping the Vision Alive…Even from the Office! You’re welcome, luv! I hope it continues to inspire you!